The Rep's associate artistic director Seth Gordon has a way with stories. That starts with plays, of course: he's both an excellent director and a champion of new works through The Rep's Ignite! Festival of New Plays. But he's also a magnetic storyteller in person, with a natural ability to spin yarns that are laced with observational detail and humor. So as he prepares to direct A Christmas Story on The Rep's Mainstage, we thought now would be an ideal moment to look back on his varied career at The Rep since he arrived at our theatre in 2010. The production was a lovely combination of people who were new to The Rep like me and people who’d been there for years and years before – people like Keith Jochim. Keith in particular, wherever I went with him people recognized him on the street, which I found very impressive. It was a nice education in how different humor can be – here and where the play originated, in New York. As soon as I found out I was going to direct the play, it was only going to run for another couple of weeks on Broadway and then it was going to close, so I went out to see it real quick. There’s a joke in the play that’s a very New York joke, where the Rapture is being explained to someone who doesn’t know what the Rapture is. In New York, that line stopped the show. People were laughing so hard, the actors had to hold for almost 30 seconds. And in St. Louis, that line got maybe three people laughing hysterically and everyone else just kind of chuckling. You can point to the New Yorkers very specifically from hearing that joke in St. Louis. It was Ayad Akhtar’s first professionally produced production, which is a little bit of a… my nose grows a little bit as I say that, because the fact is, he had that play and Disgraced opening at a small theatre in Chicago at almost the same time. But we opened, I believe, two weeks earlier. So we get the credit – it’s us by a nose. It was a delight to work with Ayad. He’s a very smart guy – and an excellent rewriter. Ayad had less of a sense of fealty to his own writing of any playwright I’ve ever worked with. Playwrights are wonderful people, but they tend to be really in love with their own language. Ayad was not that. And I think it made The Invisible Hand a much better play. The best thing about Venus in Fur were the rehearsal reports. Rehearsal reports tend to be very workaday observations about how, “This actress is going to need an apron in the kitchen scene. This actor is going to need a breast pocket for his pocket watch.” That kind of stuff. So this one, this one was about dog collars and bustiers and a bunch of stuff that we may actually not want to repeat in this article. Taken out of context, some of those rehearsal notes probably would have put us in jail. The set was not a realistic set, but the setup was so intimate. It was a rehearsal room with coffee. And of course, the liquid in the coffee was room temperature water with water color to make it look like coffee. We would occasionally get complaints about the coffee from audience members, who were apparently helping themselves to a cup of coffee, because it was right there, next to them. One of the strongest impressions that I remember about Guess Who’s Coming to Dinner was that it was performed a few months after Michael Brown was shot. We didn’t plan it that way, of course. It was decided that we would produce the play several months in advance of the shooting, but it was performed a few months after the shooting. So performances tended to be charged in a certain way. The moments in which the parents slowly realized that this black gentleman in their apartment… is going to become their son-in-law, the humor associated with their responses is meant to be funny, it’s meant to charge the audience, but it just seemed that much more so in this production because of the recent events. The theatre rocked with laughter every single performance. I have a strong memory of Jop (Joneal Joplin) in that production. It was his 99th play The Rep. He is – except for Kathleen Turner – the only actor I have seen at The Rep to receive entrance applause. He’d come in and the audience would applaud, because it was Jop. And my wife was in this play, Elizabeth Townsend. She was so reviled in this play, not because of her performance, but because of the character that she played. She was so hated that she received the only instance of exit applause I have ever seen at The Rep. The door would be slammed on her face, for her never to return to the play, and the audience applauded. They loved it. It was cathartic for them. It’s one of the most beautifully written American classics that many people have not seen. There were a lot of people who said to me, “I knew this play, I read this play, we studied it in school, but I’ve never seen a production in it.” So I thought it was a wonderful treat for our audience to be able to do this play. One of the lovely things that we learned about this play is how funny that the wind-up to the tragedy is. I think people were very surprised by that. ... You don’t think about that, but it’s all important because it really sets the image of this family as king of the hill. They’re stars in this little neighborhood. So you can see this man (Joe Keller), he’s in a lawn chair reading a paper in his backyard, but he’s really on his throne in his castle, and everyone comes to pay their respects. Even the little boy. Funny story about the little boy: we had auditions for kids to cast that role. However, we had double auditions for the kids in All My Sons and the kids in To Kill a Mockingbird. (Mockingbird director) Risa Brainin and I sat side by side and audition all these kids together. Then it came time to decide who gets which kids. And she had a look on her face that made me think, “She’s making a real sacrifice doing this.” She said, “The only thing is I don’t want to cut my hair.” So we put her in a Yankees cap. 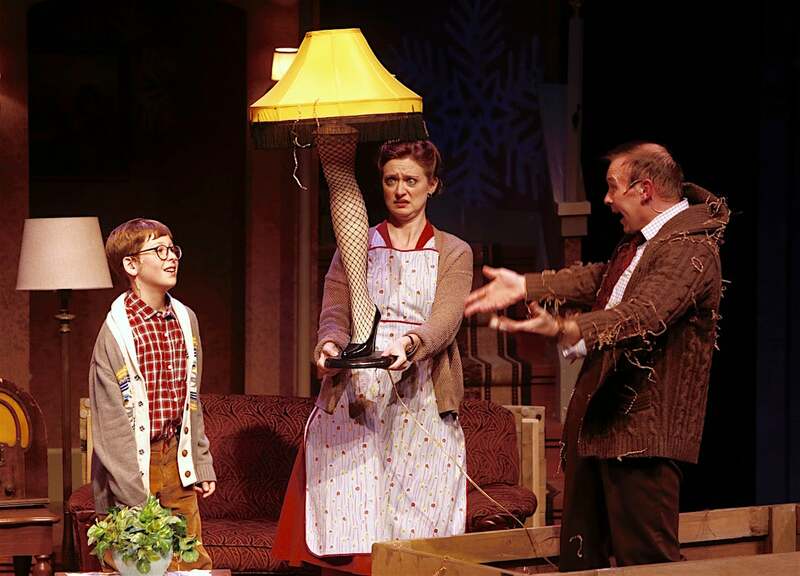 And (Ana) is playing Esther Jane now in A Christmas Story. You could not have a girlier role. And Charlie Mathis is playing Ralphie. The Rep: You’re going to get to direct him at long last. I am doing it as we speak!